During the Winter 100 event I had the opportunity to try out the Drymax Mini Crew Maximum Protections socks. The design and construction of the sock is designed to minimise the chance of blisters during long runs by keeping the feet dryer and minimise the amount of friction between skin and sock. Mesh panels on the top of the sock aim to release sweat vapour out of the top of the sock and shoe and keep the feet cooler and drier. The socks were described as medium density. The socks were less padded than the Sealskinz socks (which can be described as thick with little flexibility) I wore later in the race but felt more padded than Injinji Mid-Weight Toe Socks which I have used on previous long races of 100 miles in length. Whilst the Injinji Toe-socks helped prevent my toes rubbing against each other, I have found they do not offer enough padding and feel a bit thin after a few uses and washes. Prior to the race I went through my usual preparation of placing compeed plasters on any usual hotspots on my feet and whilst not necessarily recommended, adding a layer of sudocreme over my feet prior to putting the socks on. I put the Drymax socks through 50 miles of the Winter 100 (see recent report) where the ground conditions were extremely wet and muddy and a good test of some of the harder conditions you are going to experience on a run. 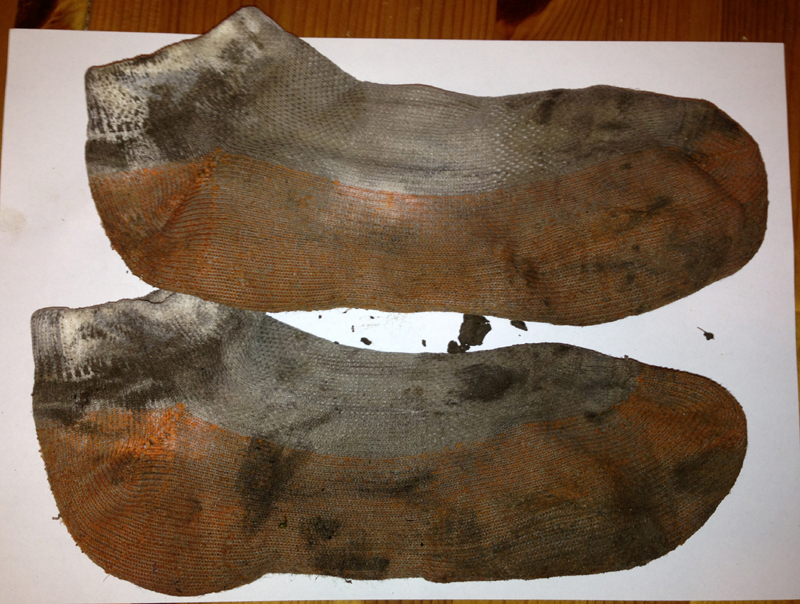 The picture below shows the state of the socks after the race. Following use, the socks felt comfortable to wear and had sufficient amount of padding (although unable to comment how they feel after several uses and washes at the moment). The conditions of the Winter 100 meant my feet got completely soaked and covered in mud during the run and there was simply no way to avoid this. Whilst the Drymax socks were not waterproof, they did a reasonable job of draining the water from my feet so I didn’t feel like my feet were constantly squelching around. After 50 miles of running, I had decided to change the socks anyway to a fresh pair (as well as the rest of my kit due to the wet conditions) and as I changed socks and examined my feet (beneath the layers of dirt) I was pleased to report no blisters so the socks had passed their initial test. 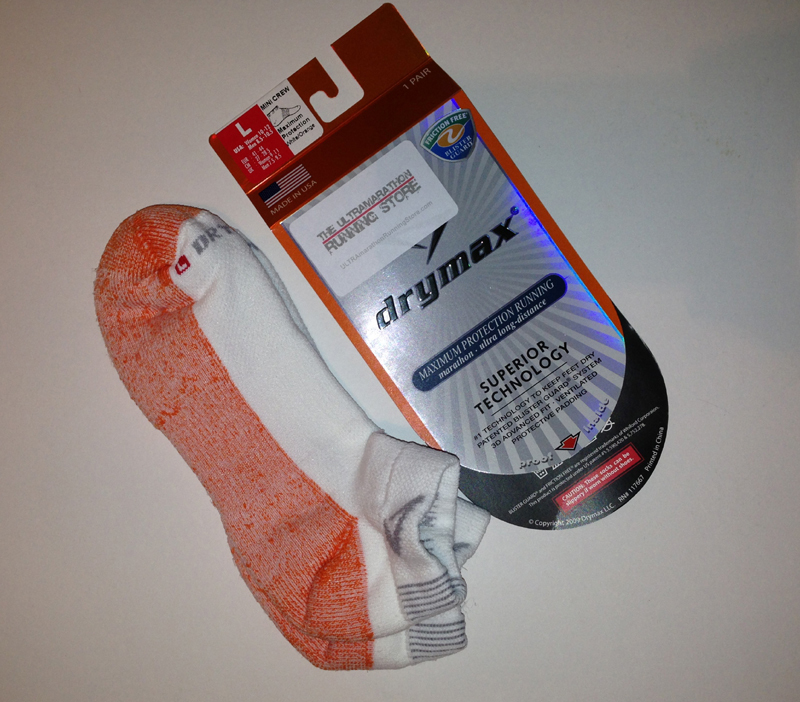 I was pretty satisfied with the performance of the Drymax socks and would definitely use their socks again. I might experiment with some different versions for summer/winter conditions. (Note: I wore the Drymax trail running socks for the last wet and muddy 25 miles of the Winter 100 and these also felt comfortable but have yet to test them multiple times and over longer distances).